Last week, I wrote about Recovering Photos and Video from Formatted Compact Flash. After recovering the lost video and photos, I started using another Sandisk card which I purchased at the same time. (I usually rotate my Compact Flash cards.) I had a similar problem copying files off this card, but I compared the list of files and caught the error. Still, after over 1-year of active use, I decided that it was time to start fresh. I decided to reformat my old Compact Flash cards. It’s really easy. 1. Use a USB Compact Flash Card Reader and attach to your PC. As I found out last week, just formatting the Compact Flash card in my Canon 7D does not completely wipe out all data on the card. All that data is still there. The only way to truly wipe these cards is to use a card reader and reformat through your computer. 2. 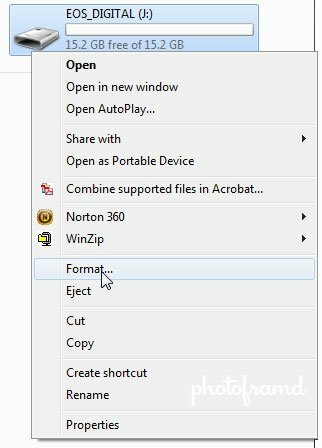 Right click on the USB drive and select Format. Windows 7 does a great job at reformatting Compact Flash Cards. But, the process is the same on all Windows operating systems from XP on. With the Compact Flash in a USB Card Reader, the card will appear on your desktop as a removable drive. Just right click on it and select Format. 3. 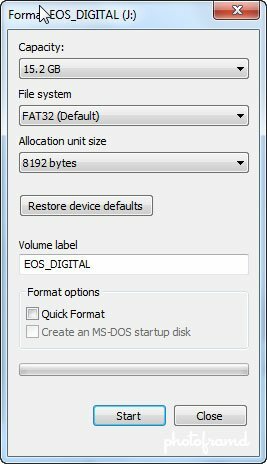 Reformat the card as FAT32. Very important – the card must be formatted as FAT32. (This is true for most digital SLRs and point-n-shoots.) On Windows 7, the default settings will be FAT32. Be sure to uncheck the Quick Format option. This is necessary to completely wipe the Compact Flash card. 4. Click OK on the Warning Dialog Box. You will see this Warning that you are about to erase all data. Click OK to start the formatting process. You will next see Dialog Box from Step #3 keeping track of the process with a green progress bar. 5. When the process completes, you will have a clean Compact Flash Card. That’s it. It’s really that simple. All data has been wiped and any corrupt files have been removed. 6. You can verify this yourself. After completing the process, I decided to test the reformatting process. 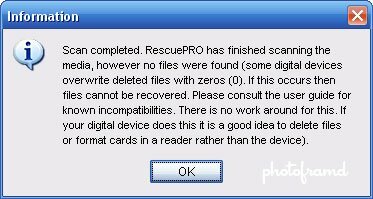 I ran the reformatted card through Sandisk’s RescuePRO Deluxe which I used last week to restore files. I searched for all files. After about 10 minutes, this dialog box popped-up indicating no files were found. I also tried reformatting a Compact Flash card through an older PC running Windows XP. Surprisingly, Sandisk was able to recover those files. If you do have an older PC, you can still completely wipe your Compact Flash cards. Take a look at the next step. 7. 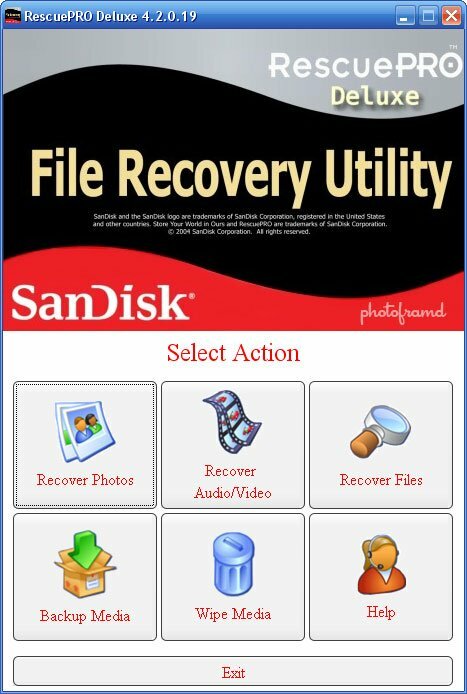 Some Recovery Programs will also Wipe Compact Flash Cards. Sandisk’s RescuePRO Deluxe has a button to Wipe Media. This process will also thoroughly wipe the Compact Flash Card. I verified the process by running it through the same program to Recover Files. Again, after about 10 minutes, the dialog box popped-up indicating no files were found. So, if you start having a problem with a Compact Flash card, drop buy new ones. Try reformatting them first! Canon 7D Tips: Auto-focus not working? Check your settings. Canon 7D Tips – What’s that sound?